Beer Park at Paris Las Vegas is the Las Vegas Strip’s first rooftop bar and grill. It features a 10,000-square-foot deck overlooking the Strip, an outdoor grill, communal picnic tables, an array of TVs tuned to sports programming and a grassy lawn on which to play classic bar games like pool and darts. The menu features American cuisine served from roaming carts with concession-style offerings, meats and other foods prepared on a custom-made Budweiser beechwood grill and more than 100 beer selections. Beer Park, 3655 Las Vegas Blvd. S., Las Vegas, NV 89109, 702-946-7000, 888-266-5687. Las Vegas will soon get its first Cracker Barrel Old Country Store, which is expected to open in late 2016 at the Silverton Casino Hotel Lodge. Currently the closest Cracker Barrel locations are 103 miles away in Kingman, AZ, and 120 miles in St. George, UT, and the company has nearly 650 outlets in 42 states. The company is known for its vintage country-style buildings with a covered front porch, complete with rocking chairs that are available for sale and general/gift store offering some of the foods served in the restaurant. The dining room will feature a fireplace, plus old pictures and antique implements covering the walls. The kitchen will serve Southern dishes including all-day breakfast with biscuits and country ham. Cracker Barrel Old Country Store, 3333 Blue Diamond Rd., Las Vegas, NV 89139, 702-263-7777, 866-946-4373. Harvest by Roy Ellamar has opened at Bellagio, replacing the Asian fusion Sensi. Ellamar also helmed Sensi, but Harvest marks his first restaurant concept, and he has gone in a new direction, debuting a farm-to-table restaurant that highlights the best local ingredients, supports regional farms and offers sustainable cuisine. The menu features charcuterie selections and artisanal American cheeses; vegetarian dishes such as roasted baby beets topped with spiced yogurt and pickled Asian pear; sustainable seafood cooked in a special stone oven; snack wagons traveling from table-to-table with small selections; and dry-aged and grass-fed beef, and a rotisserie featuring a rotating selection of organic poultry, pork and game birds. Harvest by Roy Ellamar is open for dinner nightly from 5 p.m.-10 p.m. nightly and is located in Bellagio’s Spa Tower. Harvest by Roy Ellamar, Bellagio, 3600 Las Vegas Blvd. S., Las Vegas, NV 89109, 702-693-8800; 866-259-7111. Just after celebrating its 20th anniversary at Palace Station, The Oyster Bar has expanded to its sister property, Santa Fe Station. The new location is also small, with seating for 21 at the bar and a few tables, and features an open kitchen, where dishes are made-to-order and cooked in front of guests in steaming kettles. The menu includes a selection of pan roasts, gumbo, clam chowder, cioppino, seafood jambalaya and fresh oysters on the half shell. The Oyster Bar, 4949 N. Rancho Dr., Las Vegas, NV 89130, 702-658-4900. HEXX kitchen + bar at Paris Las Vegas will observe National Chocolate Lovers’ month by offering complimentary dessert tastings on Saturdays from 1 p.m.-5 p.m. throughout the month of February. The dessert tastings will include an array of petit fours, made with HEXX’s signature chocolate and newly introduced milk chocolate, presenting flavor profiles representative of Madagascar, Tanzania, Ecuador, Peru and Venezuela. In addition, behind-the-scenes tours of HEXX’s chocolate kitchen will be offered daily throughout February. Tour reservations can be made by visiting Eventbrite's website. HEXX kitchen + bar, 3655 Las Vegas Blvd. S., Las Vegas, NV 89109, 702-946-7000, 888-266-5687. 35 Steaks and Martinis at the Hard Rock Casino & Hotel is offering a three-course winter prix-fixe menu through February 29, 2016. Priced at $59 per person, or $99 for two, the courses include a choice of wedge salad with bleu cheese crumbles and applewood-smoked bacon or five onion soup with bacon broth, toasted Gruyère and Provolone cheese; Scottish salmon with sherry reduction and pickled red onions, pan-roasted chicken made with an airline chicken breast, confit crispy leg and trofie or an eight-ounce filet mignon with sweet potato purée and red wine essence; and crème brûlée made with almond tuile, crisp caramel and berries or seasonal cheesecake. 35 Steaks + Martinis, Hard Rock Hotel & Casino, 4455 Paradise Rd., Las Vegas, NV 89169, 702-693-5000, 800-HRDROCK. Emeril Lagasse's Table 10 at The Palazzo has introduced an interactive dining experience with a daily rotating selection at the "snack bar," in which chef de cuisine James Richards will create dishes using the freshest local and unique ingredients available that day. No two menus will be the same, and chalkboards display the items of the day, with Richards only creating limited servings of each dish. Once they're gone, they will be marked off the menu. Offered exclusively at the eight-seat food bar with views into the kitchen, diners can personally interact with the chefs on the line. Recent items have included lobster truffle turnovers, duck fat popcorn and roasted marrow bone. Prices range from $5-20, and the menu is available daily starting at 5 p.m. Table 10, The Palazzo Resort Hotel Casino, The Shoppes at The Palazzo, 3327 Las Vegas Blvd. S., Las Vegas, NV 89109, 702-607-6363. Dragon Noodle Co. & Sushi Bar at the Monte Carlo Resort & Casino has opened a casual noodle bar offering a variety of authentic soup noodle dishes from cultures throughout the Pacific Rim, including Vietnamese, Japanese and Chinese. Located inside the lounge, the "restaurant within a restaurant" seats 12 and is designed for guests to get a quick bite. The menu, priced from $12 to $15 and available exclusively at the noodle bar or in the lounge, includes Vietnamese pho with a house recipe of beef and pork bone broth and rare eye round, beef ball or combo with traditional tendon and brisket; Chinese noodles with housemade broth, and BBQ pork, roast duck, chicken, beef or mixed vegetables; and Japanese udon with traditional fish broth, shrimp tempura, chicken or vegetables. Hand rolled wontons are available as an addition to any bowl and a selection of Chinese, Japanese and American craft beers are available to complement the dishes. 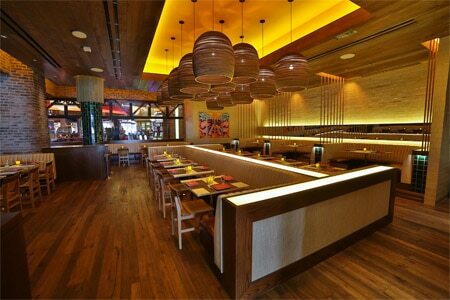 Dragon Noodle Co. & Sushi Bar, Monte Carlo Resort & Casino, 3770 Las Vegas Blvd. S., Las Vegas, NV 89109, 702-730-7965. Restaurant Guy Savoy at Caesars Palace has appointed Julien Asseo as its new executive chef. Asseo hails from Libourne, France, and obtained a Bachelor of Arts in culinary arts at the Lycée Hôtelier de Gascogne, near Bordeaux. After graduating, he worked in Paris at La Fontain de Mars, where he advanced from commis to chef de partie. In 2009, Asseo had the opportunity to open Rivera in Los Angeles as sous chef, and in 2009, he came to Las Vegas and worked under renowned chefs Rick Moonen and Joël Robuchon in their establishments. He came to Restaurant Guy Savoy in 2011, where he began as sous chef and eventually advanced to chef de cuisine and studied extensively under chef Savoy, as well as former executive chef Mathieu Chartron. Restaurant Guy Savoy, Caesars Palace, Augustus Tower, 3570 Las Vegas Blvd. S., Las Vegas, NV 89109, 702-731-SAVOY (7286); 877-346-4642. After closing out 2015, Mercadito at Red Rock Casino, Resort & Spa has closed. The restaurant space will be taken over by Clique Hospitality, the restaurant and bar management group from partners Andy Masi, Brian Massie and Shane Monaco. The group plans to replace it with Libre Mexicana Cantina, Spanish for free, which will open in February 2016. Libre will be sandwiched between two other Clique restaurants, Hearthstone Kitchen & Cellar and Salute Trattoria Italiana and the menu will be designed by chef-partner Brian Massie. On the menu will be crispy dynamite rock shrimp taco, bubbling queso fundido, carne asada skirt steak, chicken brown rice bowl and steak fajitas. Mercadito, 11011 W Charleston Blvd., Las Vegas, NV 89135, no phone.